With the holiday networking season upon us, I’m reminded of a lesson I learned from Jimmy Carter on how to connect with people. 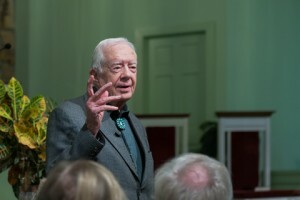 As a cub reporter 26 years ago at The Times in Gainesville, Ga., I had the opportunity to interview Carter. He had been out of the Presidency for about four years and was hosting a health care conference at Emory University. I don’t remember much about the interview. I do remember being nervous as I waited for him alone in a conference room. I remember him sitting down and answering my questions with grace and patience. He gave me the same respect than he would have given Bob Woodward. While I don’t recall what my story was about, I remember that he gave me some provocative quotes. But there is one thing that I recall vividly. After the interview, the former President didn’t rush out. He started asking me questions – just general stuff about my life, where I was from, how I came to work in Gainesville, etc. To this day, I can still see the Jimmy Carter looking me straight in the eye and listening. For those few minutes (it couldn’t have been more than ten), he focused on me alone. It was like he had decided that this 23-year-old reporter was the most important person in the world to him at that moment. I’m convinced that Jimmy Carter became President because of that ability to form a quick personal bond. I suppose I could dismiss this as the charisma of a master politician. But I also think that the source of his charm is easy to identify and learn from. It started with his eyes. As I spoke, he looked at me with total concentration, never looking away. His eye contact made it clear that he was focused just on me. Next was the smile. Of course, the Jimmy Carter smile is famous and often caricatured. But up close, when coupled with the eye contact, it wasn’t phony. He smiled at the right moments, crinkling his eyes and letting me know that he was paying attention. The smile told me he was enjoying himself. And that made me feel good. Finally, I think Jimmy Carter found it in his heart to be truly interested. I know that he doesn’t remember me now. And maybe I’m naïve. But it didn’t seem fake. I think he just cared about people and wanted to connect with me. It was a gift. About five years ago, I met Jimmy Carter a second time. I was on a late night flight to Atlanta from New York City. As I boarded the half-empty airplane with other rumpled business travelers, Jimmy and Rosalynn sat in first class. Before takeoff, Jimmy walked to the back of the plane. He deliberately shook everyone’s hand, and said “Hello.” “I’m happy to be traveling with you,” he said to me. And as he said it, he looked me straight in the eye and smiled. Jimmy still had it –eye contact, a smile, and a genuine interest in making a connection. Something to keep in mind as you head off to the holiday party season.